Grab your poodle skirt, slick back your hair and get ready to rock ‘n’ roll 50’s style 'cuz the national tour of the new Broadway production of the musical "Grease" is making its way to Boston’s Citi Performing Arts Center Wang Theatre for one week only, April 27 - May 1. The tour is directed by David John O’Brien with choreography by Joyce Chittic. "Grease" features a book, music and lyrics by Jim Jacobs and Warren Casey, with additional songs (from the film) by Barry Gibb, John Farrar, Louis St. Louis and Scott Simon. After spending a summer hopelessly devoted to Sandy Dumbrowski -- the new girl in town --Danny Zuko is thrown for a loop when Sandy walks into Rydell High on the first day of school. What follows is a rock n' roll celebration of growing up, cruising with friends and going steady. 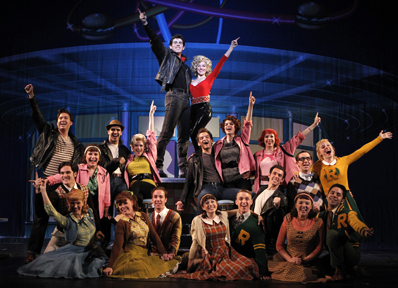 In addition to the songs made famous by the original stage production, including “Summer Nights,” “Greased Lightnin’” and “We Go Together," this new production of "Grease" also features songs from the hit 1978 motion picture including “Sandy” and the Academy Award nominated “Hopelessly Devoted to You”in addition to “Grease” and “You’re the One That I Want,” both of which were #1 hits on the Billboard Top 100 list. Alyssa Herrera will star as “Sandy” with Matt Nolan as “Danny.” Matt was a finalist on NBC’s “Grease: You’re the One That I Want” and recently appeared in the national tour of "Hairspray." "Grease" originated in Chicago before making its New York premiere Off-Broadway at the Eden Theatre on February 14, 1972. After 128 sold-out performances, the show made the transition to Broadway, taking up residence at the Broadhurst Theatre on June 7, 1972. "Grease" was nominated for seven Tony Awards in its spectacular initial run. In 1972, the show moved to the Royale Theatre, making its final transfer to the Majestic Theatre in 1980. When it closed, it ranked as the longest running show in Broadway history, having played 3,388 performances. In 1978, "Grease" became a popular feature film starring John Travolta and Olivia Newton-John. A Broadway revival in 1994 played 1,503 performances and won three Tony Award nominations. The most recent Broadway production opened in 2007 and was nominated for a 2008 Tony Award for Best Revival of a Musical. For tickets and information, stop by the Wang box office, call 866-348-9738 or visit www.citicenter.org.